MINI Cooper Acccessories + MINI Cooper Parts :: OutMotoring.com MINI Blog :: MINI Performance Parts :: Vibra Technics Gearbox Mounts! Synopsis: Upgrade your MINIs gearbox mount. 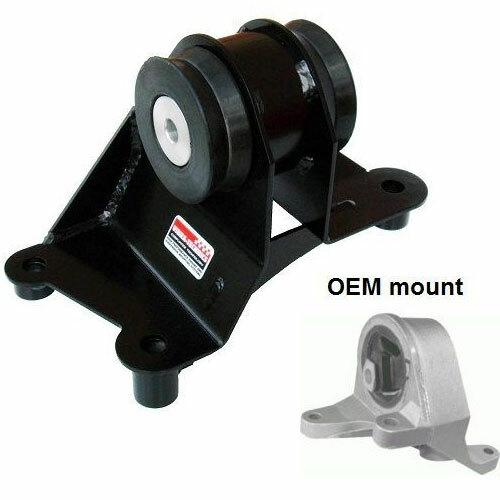 This uprated mount is a direct replacement for the OE fragile OEM cast aluminium Gearbox mount and increases durability whilst reducing engine movement in all directions. This high strength welded steel mount bracket is fitted with a" fast road" spec rubber insulator. An essential replacement for high performance road or track day cars. Replaces OEM part number 22316754422 (shown in image for reference only). These are offered in 2 versions from the manufacturer however we only offer the ROAD version as shown. It still gives outstanding vibration and noise isolation- going with the RACE option (available as a special order) may increase vibration and road noise considerably. This is a more great option to the Powerflex bushings we also offer. High performance Gearbox bracket and bushing. Comments on Vibra Technics Gearbox Mounts!